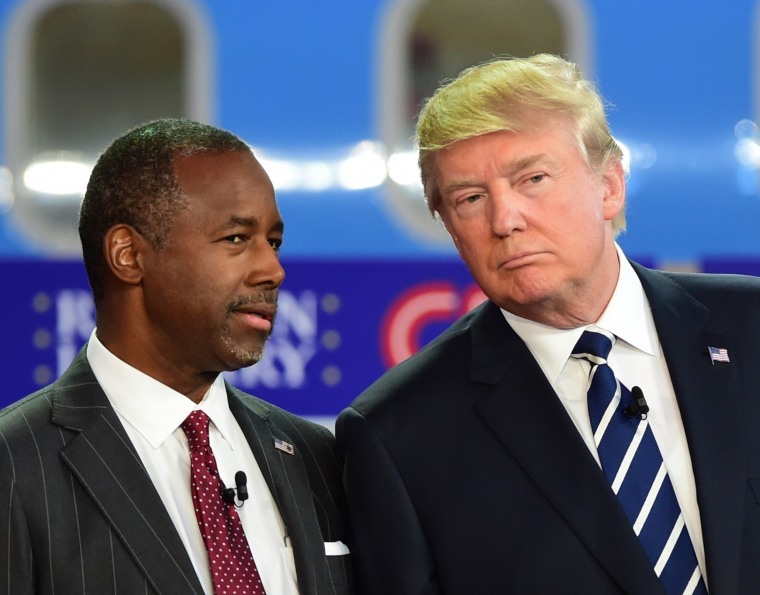 The newest Quinnipiac poll shows Trump remaining in the lead, but Carson fading. The big view, from the New York Times' Jonathan Martin: "Many leading Republican officials, strategists and donors now say they fear that Mr. Trump’s nomination would lead to an electoral wipeout, a sweeping defeat that could undo some of the gains Republicans have made in recent congressional, state and local elections. But in a party that lacks a true leader or anything in the way of consensus — and with the combative Mr. Trump certain to scorch anyone who takes him on — a fierce dispute has arisen about what can be done to stop his candidacy and whether anyone should even try." BUSH: NBC's Jordan Frasier writes of Bush’s latest appearance in the first caucus state: "Jeb Bush had his campaign squarely focused on Hillary Clinton and the state of New Hampshire on Tuesday despite being on the stump in Iowa where voters will have the first official say in the 2016 race just two months from now." CLINTON: Monica Alba and Alex Seitz-Wald report from Montgomery: "From the pulpit of the historic Dexter Avenue Baptist Church, Hillary Clinton on Tuesday called for a continuation of the civil rights movement kicked off here by Rosa Parks and Dr. Martin Luther King, Jr., 60 years ago. She also told a roomful of black lawyers that the criminal justice system, riven with racial discrimination, should work on the side of 'love.'" CHRISTIE: Muslim leaders in New Jersey, once warmly allied with Christie, are not happy about his recent rhetoric about Syrian refugees. He's hoping his national security pitch boosts him in New Hampshire, the Wall Street Journal points out. CRUZ: The Washington Post gives Four Pinnochios to his claim that "the overwhelming majority of violent criminals are Democrats." The AP notes the limits of Cruz's foreign policy positions: "[W]hile promising to destroy the Islamic State, beat back aggression from Russia, China and Iran, and ensure extremists don't infiltrate the U.S. homeland, Cruz also places notable limits on his approach to national security...The 44-year-old first-term senator, trying to cement his place in the top tier of Republicans running for president, outlines a prospective foreign policy that is both broadly ambitious and cautious at times in the specifics." PAUL: He penned an op-ed in the Courier-Journal that opens: "If you haven’t heard already, I’m running for president. But that doesn’t change the fact that I’m your senator, and that my number one priority is doing the job I was elected to do and serving you... Kentucky is and always has been my priority, which is why I have a nearly perfect attendance record in the Senate - something not many of my colleagues can say about themselves. I know my job is to be your voice in Washington, and I work hard to make sure Kentucky gets the representation it deserves." TRUMP: Kailani Koenig notes that last night's Trump rally in New Hampshire was relatively subdued due to bitter weather. POLITICO notes that New Hampshire voters are rewarding candidates who aren't necessarily spending oodles of time in the state. He told NH1.com of Clinton's emails: "Hillary Clinton's greatest thing in my opinion, if she pulls it off, will be the fact that she's able to avoid going to jail because what she has done is a disgrace." NBC's Frank Thorp writes that Democrats are accusing Mitch McConnell of holding up a bill to help 9/11 responders. Congressional leaders have finally agreed on a long-term transportation bill. It's complicated, part 8476326: "On the front lines of the battle against the Islamic State, suspicion of the United States runs deep. Iraqi fighters say they have all seen the videos purportedly showing U.S. helicopters airdropping weapons to the militants, and many claim they have friends and relatives who have witnessed similar instances of collusion. Ordinary people also have seen the videos, heard the stories and reached the same conclusion — one that might seem absurd to Americans but is widely believed among Iraqis — that the United States is supporting the Islamic State for a variety of pernicious reasons that have to do with asserting U.S. control over Iraq, the wider Middle East and, perhaps, its oil." ILLINOIS: The latest from the Chicago Sun-Times: "Now that Rahm Emanuel has gone against his political instincts by firing his larger-than-life police superintendent, the mayor faces an even bigger political dilemma that could define his legacy. He must find a worthy replacement for Garry McCarthy without making worse racial tensions brought to a boil by the Laquan McDonald shooting video." And the AP gives a rundown of the unanswered questions in the case -- and the possible impact on Emanuel himself. *** Wednesday’s “Andrea Mitchell Reports” line-up: Today at 12p ET Andrea Mitchell interviews Rep. Adam Schiff on the U.S. strategy against ISIS; WMAQ political editor Carol Marin on the latest from Chicago after Mayor Rahm Emanuel fires his top cop; USA Today’s Susan Page and the Washington Post’s Chris Cillizza on 2016 politics; plus NBC’s Katy Tur, Kasie Hunt, John Yang, Richard Engel and Luke Russert.